Books-by-Mail service is available to registered Needham Public Library borrowers who are prevented from using the Library's facilities due to medical disabilities. Library materials are sent to the homebound via the U.S. Postal Service in sturdy canvas bags. 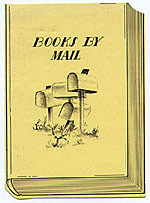 Books-by-Mail service may be requested by a recipient or by a caregiver, by telephone or in writing. For more information, call Karen at 781-455-7559 x 206. Please fill out this form to register for homebound services.